UPDATE: the NCCS (Northern California Coastal Survey) has made posters available. Unlike most coastal areas of the former United States, the population of the archipelago has dramatically increased despite the 200 foot rise in sea level over the past 60 years. Pundits debate whether this is due to the increasingly tropical temperatures or the creative and cultural explosion due to density. Regardless, the 4 million people now living on the SFA are demanding expansion of the San Andreas airport — studies are underway to build three more runways on the former 280 right of way. The cruise ship berths along Divisidero Harbor continue to be upgraded, while negotiations are underway with Port Orinda and Caldecott Harbor to handle the cargo from the outdated facilities at Geary Sound. With the addition of the 6th high speed rail tube to the mainland, the original tunnels (completed in 2025) will be dedicated to cargo. Development of high rises along the Sunset Coast and Cape Dolores has not been without controversy. The SHSFPA (Submerged Historic San Francisco Preservation Association) has once again protested and filed an environment historic review. “Old San Francisco is still alive in our hearts and minds, even if only the tops of the buildings can be seen! Look at the Flickr archive! ¡Viva Valencia!” While the SHSFPA frustrate many, all agree that their work floating Victorians and Italinate era homes and converting them houseboats has been a grand success, and has fueled a tourist boom along the Noe, Bernal and Dolores docks. The historical reenactments of life in the Mission District of the early 21st century have proven particularly popular. SF topological map via the most excellent Urban Life Signs. It turns out they were also working on a 25 foot sea level rise map, something we could very well see in our lifetimes. I dreamt this once, about fifteen years ago. I was standing on Twin Peaks and water rushing up Market Street. Freaked. Me. Out. I had a similar dream. A tidal wave rushed up Taraval to about 21st Ave. I lived on 17th Ave at the time so I was … excited! GRRRRRR. The suspension bridge to Bernal Isle would have been completed 10 years ago, were it not for all the NIMBY opposition. It’s OK, we’re all kayakers here in the best neighborhood in the city. Still…..he does have a point, it should have been done years ago. Alright! My house is 4 blocks from the beach! I’m totally taking over that laundromat on my corner and turning it into a surf shop. I’ve been working on adding bathymetric undersea topography, so we may have a map showing what SF looked like 120 years ago. Oh hell yes. You and I need to talk. 20K years too! I want to see this, too! Johnny O, shoot me an e-mail. It’s on my blog site. I had dinner with friend Steve Boland yesterday night. We should all meet up. A less catyclismic flood map I’ve worked on is coming in a moment. Gotta love the truth in advertising on the airport name! Because building airport runways on the biggest fault in California is the natural successor to having a freeway on the biggest fault in California. Right on! It’s not like the runway will *cross* the fault or anything. What could go wrong? I mean, it’s that or a floating airport. Amazing. I’ll enjoy waving to you from my beachfront property above Glen Narrows! You know the dogs will love the short commute to unlimited swimming! Seriously entertaining. You win the internet today! Also very timely considering KQED’s Forum today on the film about the Maldives. Just this morning, I was wondering why one of those “150 year old bridges across Glen Narrows” aka Highland Ave is being worked on this week… Now I know. Actually, my dog usually looks down from there upon the river of cars on San Jose below. I always thought that it was because he imagined his puppyhood back in the old country by the river Garonne, but I now realize that he’s just thinking about the future when it will all be water. I am now daydreaming about the dive sites in the Mission and Sunset… In the meantime, I’m off to fit my bike with pontoons. Love the maps, love the story, but must quibble… The 300-foot map is basically nonphysical, right? We’d need to import the last 40 feet of water from off-planet to get 300 feet of sea level rise. 200 feet is possible — even likely on current trends — but probably hundreds or even thousands of years out, not decades from now. Sea level rise has been accelerating, but there’s a big gap between 3 mm/year and 3 feet/year. Yeah, total icepack melt would raise ocean levels “only” 80 meters / 260 feet. Of course, this presumes that the landmass itself doesn’t subside. Wait, Colma DOESN’T stay??? Everything I learned from the movies is wrong. where’s Kevin Costner’s floating island? I thought a significant factor in sea level rise was water’s expansion at higher temperatures? I don’t have any numbers for it, but if trapped greenhouse gases really did become a runaway dynamic and the atmosphere continued heating, wouldn’t the ocean keep rising even after all the ice melted? At 345 feet, there’s still a bit of Bernal Hill…but there’s no more Florida. Since this is intended as science-fiction verging on science-fantasy, I know this is nitpicky, but why do the shorelines cross contour lines? This doesn’t really make sense. Is it because what water line is actually based on a different data set than the contours shown? Perhaps some artistic license was taken to make the map more amusing? I’d say artistic license, justified by tectonic settling. 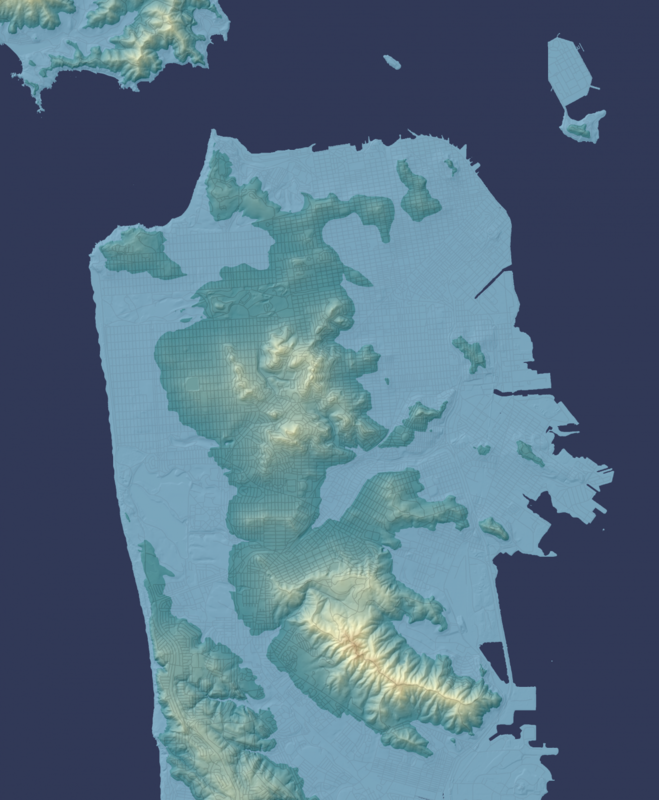 Seriously though, the central San Francisco Island would actually go as far south as San Bruno Mountain, which is really a ridge. And if you were wondering, yes the “South San Francisco: Industrial City” sign is safe, just barely. In fact it’s the most southerly point of the island. However, we may have the Geneva Escarpment due to calls for filling in bays to meet population demand, airport runways, or filling in the likes of the Glen Narrows or the Excelsior Lagoon. Please Post nerdy road map. 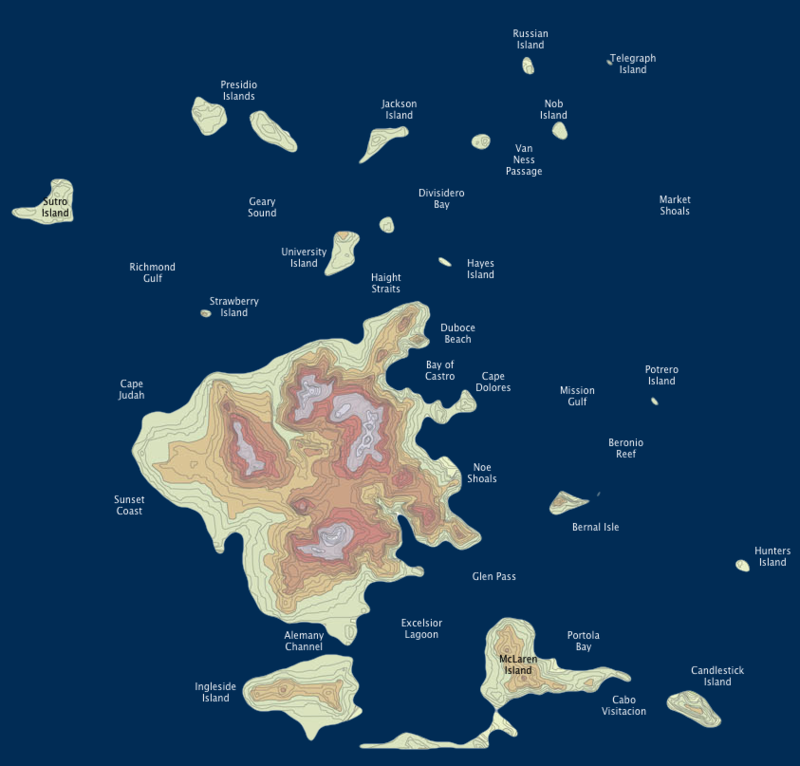 I posted Eric’s pretty damn fabulous map here. Any predictions for Los Angeles County? LA doesn’t looks so good if you’re west of the I-110. East of there it depends, but it’s mostly spared from there on. I’m not discounting the possibility, mind you, but the disappearance of the East Antarctic ice sheet would mean the world would be in a full-blown interglacial with no ice sheets on the planet at all. It’s a nice multimedia story, though, very David brin. omigod, what a trip. it’s like waterworld, before all is lost. I’ve often imagined having a boat on my building’s roof, atop Nib Hill. Nice to see Nob Hill is spared, but an island, nonetheless. Thankfully, I’ll be dead by then. Moot point. More Fear Mongering… especially when you consider the revised assessments of overall glacial melting. Look up the 2012 assessments people… then get a grip chicken little! I have a standing offer to buy coastal properties at an extreme discount in order that properties owners may cut their losses when SF floods due to “global warming”. This could conceivably happen to San Francisco. The Louisiann Gulf Coastline is receding rapidly. Are we getting folks ready to work with this future happening? What’s a simple thing we can do today to help? I thinmk, I might be wrong, but I think that a 200 foot rise of sea level would leave a very narrow land bridge fromt he coastal hills (milagra ridge, and maybe the other side of Portola Valley) that would still connect the SFA with the Confederate States of San Jose. Many Colmans died in 2051 trying to keep the land bridge open when levels hit 50 meters. 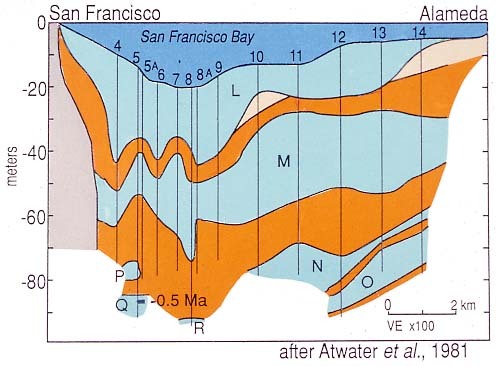 Since measurements first began in 1848, during the entirety of the Industrial Revolution when the pollutants and greenhouse gases released into the atmosphere were hundreds of times worse than today because there were NO fllters or pollution-controls back then, the sea-level rise in San Francisco has been less than one INCH. Not foot. Inch. Less than an inch in 164 years of industrial activity. Global Warming is a crock of baloney. Sea-level rise fantasies are a crock of baloney. You have to resort to fictional scenarios because reality does not match your fantasy. He’s wearing sunglasses, not sure if blinding him with science is going to work. I know, right? Other annoying scientific inconveniences include: gravity, evolution, thermodynamics, entropy and basic chemistry and physics. If only we could dispel those myths, life would be a whole lot easier. Wake up people! Look, as long as it’s still rent-controlled, I’m keeping my underwater apartment in the ‘Loin. Read Ursula K. LeGuin’s novel Always Coming Home to see what life will be like in the Valley of the Na (which we know as the Napa Valley) in 20,000 years. We don’t censor. The WordPress filters flagged your comment and dumped it in the spam folder. If you actually bothered to log in, people could freely go to your website and see what you have to say. Very amusing (and nicely written!) scenario, but I must argue with one crucial point — as usual with such science-driven scenarios, there’s a hidden assumption that social and political conditions will largely hold steady and that the main thing that will change is the science and technology (or in this case, the environment). But I’d suggest that a sea level rise of this sort would imply a global and national economic catastrophe of a magnitude that it would almost certainly propel complete political collapse of existing institutions. Just consider what’s happening in the rest of the world if these conditions pertain in San Francisco: no more Shanghai, Hong Kong, Los Angeles, New York, Washington, Miami, London, Tokyo, Mumbai, Dubai, etc. etc. etc. This means the utter ruin of these nation-states, and with it, the associated economies. Imagine the refugee crises, and the grasping for resources that this will create. And none of this will happen gradually, but rather more through a series of catastrophic storms that rearrange coastlines by hundreds of meters in a single, unsalvageable fell swoop. We’re talking about a Hurricane Katrina / New Orleans scenario, in every major coastal city in the world, more or less simultaneously, with no one ever coming over the horizon with federal aid to help survivors. The idea that local civic associations in San Francisco will survive such a transition (much less stay focused on things like historic preservation) is something approaching a bad joke. And, with the Chinese economy in ruin, where will we import our large-scale manufactured technologies from to build all the new infrastructure this scenario talks about. 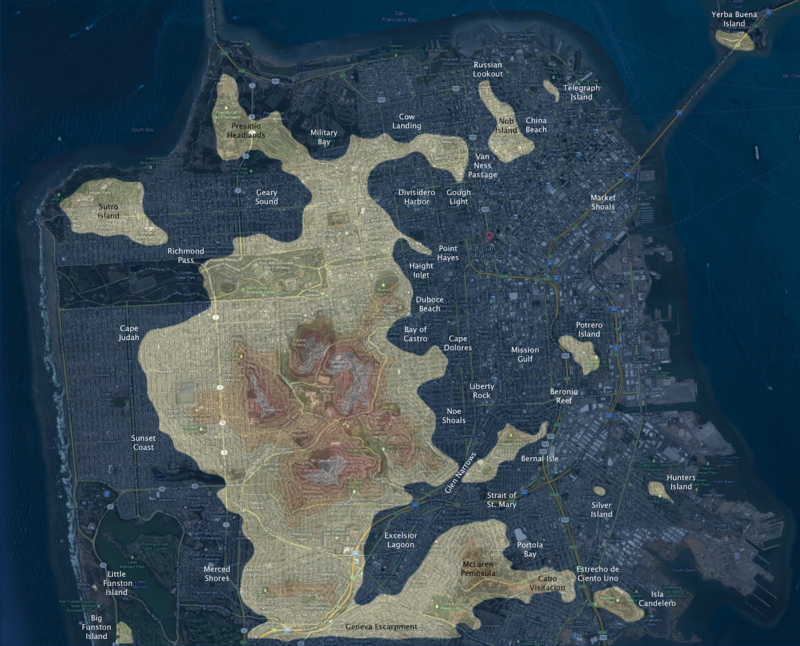 Rather, what you’re more likely to have is a catastrophic social implosion (probably including a demographic one), such that the various islands and archipelagos of the San Francisco Bay region will be ruled by warlords and clans of various sorts. This, for example, is what happened in Rome in the millennium after the Christ: 99% fall in population (from 1,000,000 to 10,000), with each of the seven hills ruled by a different warrior clan, with grazing of cattle and occasional clan fighting happening amid the ruins of antiquity down in the plains. In Rome c. 1100, almost no one remembered the origins of those ruins, but rather regarded them as a useful place to scavenge for building materials when constructing fortifications to defend themselves from rival hilltop gangs. Don’t entirely disagree. But I think you underestimate the critical role that taco boats played in maintaining civic order on the archipelago. They filled a natural void when internal combustion engines were banned and the city canal system was opened in the ’40s, serving as both a food delivery system and de facto public transit network. 80m != 300ft. Far from it. The Eastern remnants of the NOAA lost all credibility after the Great Schism of 2056 when it and other FFAs (Formal Federal Agencies) retreated to the SeaDome and devolved into non-empirical party mouthpieces. Their claims of an additional 37” of continental subsidence is discounted by all Western geologists. All hydrologists agree upon the standard 263 foot baseline. Nah, they would all move south and east, and the bridge network system would be AMAZING. Or we would just get the new GenMod gills developed in silicon valley and not move. I just this morning signed the contract to have my modest san francisco home outfitted with 365 foot stilts. The flooding won’t be as bad as all that – San Francisco has so many Dykes! The corollary question is: Where will the people live? Just by chance, if the present population numbers were to remain constant in the same general geographic area, what would be the new population densities? How many job locations will be simultaneously displaced? Does this mean that the best land to acquire now will be a 250 square mile site for a new city between LA & Las Vegas? Maybe call it Arnoldville? Hi Brian, I saw you speak at SPUR and am a huge fan of your work. 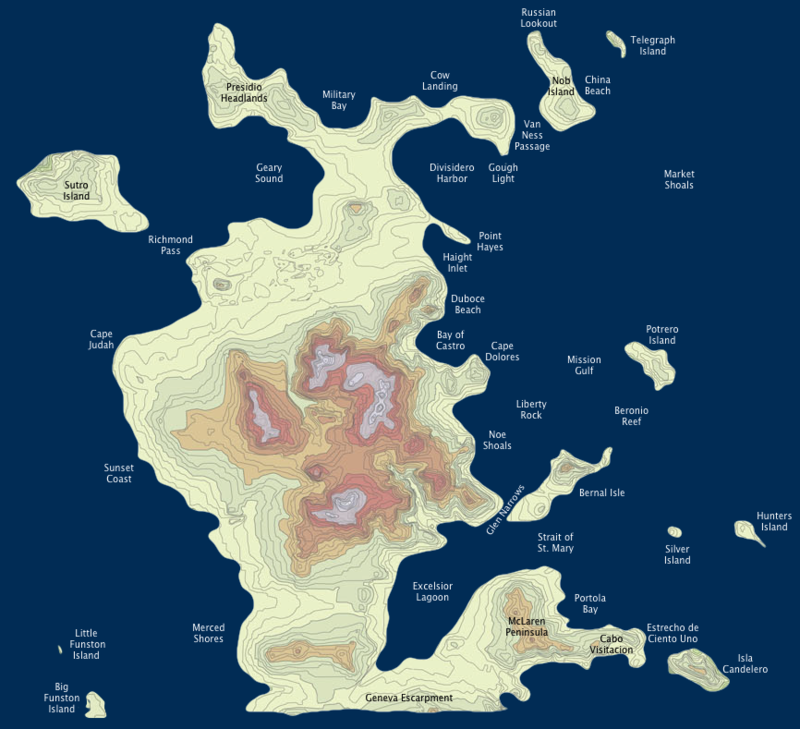 Would you ever consider making a print of the SF Archipelago or have you already? I’d love to purchase a print from you to hang at my desk. It’s just the kind of real science meets dark humor that keeps me hopeful about the future of humanity. Edit: just found the Buy a Map section!